Standard - $56.99 Only 7 left! As much as we Halloween enthusiasts hate to admit it, this season can be a bit of a scary one for kiddos. They haven't been through many Octobers so we can see why it's a little overwhelming. From their perspective, the world gets darker and adults start putting skeletons in their windows and cobwebs on their porches. That's a pretty crazy thing to take in when you've only been around for five years. But here's the thing, they've got to get into it sooner or later. It's just too much fun to pass up! Make it easier on kiddos this year with some seasonal light that stays nice and safe on the cute side of spooky. There's no need to risk your neck on a ladder with string lights this year. Instead, cast this jack-o-lantern light on the wall this spooky season. 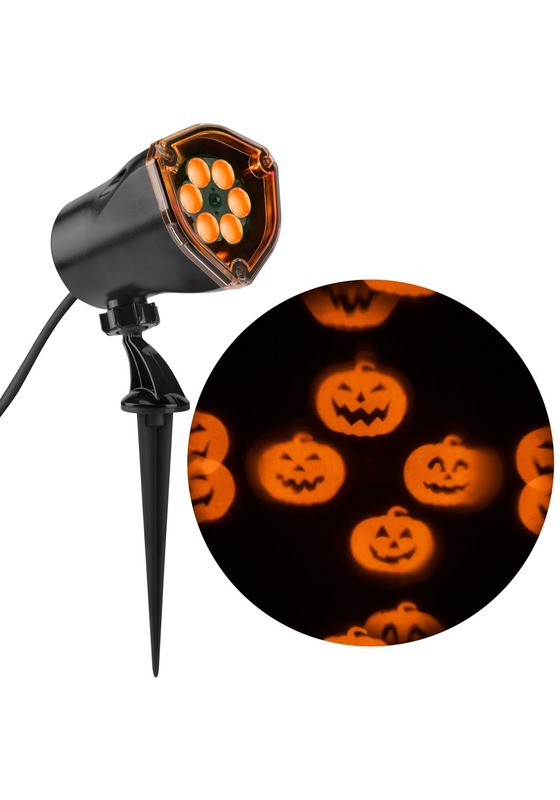 Simply stake the light into the ground, adjust the head to where you'd like the light to point, and watch the cheery Halloween spirit spread in your neighborhood! Maybe you've known exactly how you're going to carve your pumpkins for months now. Maybe this is the first time you're decorating your house for Halloween. Either way, everyone will know your stance on this holiday of spooks when this batch of friendly jack-o-lanterns is dancing on your wall!